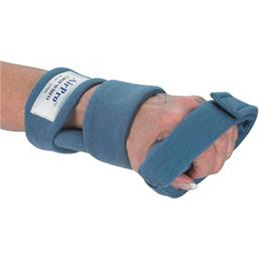 Ideal for pneumatic gentle stretch therapy to the MCP/PIP joints of the fingers. The hand should easily open enough to slip the deflated palmar bar under the fingers and into the palm of the hand. Orthotic therapy for moderate to severe wrist, hand, finger joint stiffness, or contractures. Ideal to treat adaptive tissue shortening contracture(s) of the MCP / PIP joints of the fingers of 90 degrees or more and adduction of the thumb using graduated air pressure to reverse a fisted hand. “Bend to Fit” hand moldable orthotic base can be set at the appropriate angle to support the wrist and forearm. Appropriate for treating spasticity of the wrist, hand, fingers in a fisted hand. The device is applied by slipping the palmar bar under the fingers and into the hand. Once applied, air is inserted into the air bladder to therapeutically stretch the fingers. The AirProÔ Grip will open the contracted hand approximately half way to full extension. Orthotic treatment should be continued until function is restored to the affected hand. OT's are going to love this one!! What a perfect splint for those tight fingers. The air bulb allows for gradual inflation while gently increasing the patients ROM. I have used this product many times, it is a great choice for contracted hands.